For your stay on the bay, choose from four room types with exhilarating panoramic views. Or go for a suite. Get comfy. Get in your robe. Get the remote control or get ready for a night on the town. Stay on the waterfront or explore the city and beyond. Enjoy invigorating showers that you’ll pretend you don’t know how to turn off. Have the best night’s sleep every night of your stay with luxurious bedding specially chosen to make sure you sleep just as well as you do at home – if not even better. Kick off your shoes and make yourself at home. Whether you want to fire up your email, fancy an informal supper in your slippers or simply want to drift off to sleep watching TV. Our rooms are all about ease and comfort. Easy-to-connect WiFi, luxurious bedding, and a fabulous bathroom come as standard; and if you’re in the mood for an upgrade why not try one of our superior, deluxe or premier rooms, or splash out on a suite. Whichever you choose, sit back, relax, and enjoy your stay. Relax and recharge with crisp linens and fluffy bathrobes, Aveda toiletries, indulgent bathtubs and invigorating showers. Will you even want to leave your room? After a day exploring, or an important meeting, time to take to the comforts of your room. Ready for a spot of supper in your slippers, a soak in the bathtub, and a great night’s sleep in a bed that feels like a hug? Take in the bay views from your private balcony, or comfy armchair. Relax and recharge with crisp linens and fluffy bathrobes, Aveda toiletries, indulgent bathtubs and invigorating showers. Spend the morning with breakfast in bed and the remote control. Read the paper on the balcony, soak in the bathtub, have a coffee. Spread out and work on the generously sized desk. Life is good. Bay views to die for, comfy seating and a great big desk if you really must work. Relax and recharge with crisp linens and fluffy bathrobes, Aveda toiletries, indulgent bathtubs and invigorating showers. Breathe it all in. Kick off your shoes, make yourself at home. Drop the Admiral a call for some Bao buns, grab the remote control, and set the bathtub to relax. Take in the world from your private balcony wearing nothing but your fluffy bathrobe. Who’s to tell? 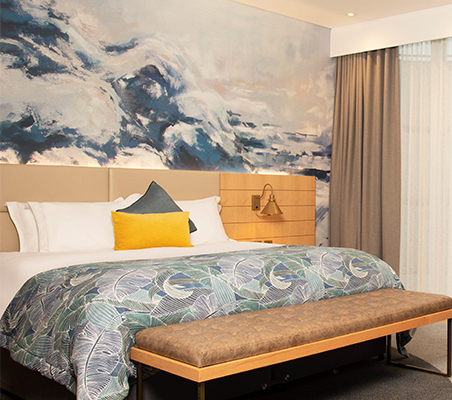 The design of our Premier rooms is inspired by our bayside location and heritage. Sink into your custom-designed bed, get some work done on the great big desk, or gaze over the waterfront from your private balcony. Enjoy the view. Take in the views, throw on a fluffy robe, relax and enjoy one of our King Premier rooms. Work, rest, play, it’s up to you. Join us in the restaurant for supper, or let us come to you, breakfast in bed? You’re very welcome. Stretch out and enjoy the space in one of our Junior suites. Sink into the luxury of your custom designed bed for a spot of shut-eye before dinner. Light and airy and open-plan, with space to spread out. Our Junior suites are full of life’s little comforts. Whether it’s the fluffy bathrobes and Aveda toiletries, or the great big desk with lots of convenient USB ports. You’ll find yourself wondering why you have to leave. There’s bags of space for stretching out and settling down in our Signature suite. Open-plan with a generous lounge area you can take in the views from the comfort of an armchair, or gaze over the waterfront from one of your two private balconies. Enjoy the space and extra little comforts of our Signature suite. Throw on the fluffy robe and indulge in fresh fruit and a selection of local treats before the complimentary voucher tempts you out to drinks in our vibrant bar. Our biggest and best. There’s lots of room to stretch out, unwind and relax after the demands of the day. Throw on your fluffy bathrobe, then chose which of your two balconies has the best view before getting spruced up for dinner and drinks. What are you waiting for? Light and airy and open-plan, with space to spread out, the St David’s suite is the best in the hotel. Take in the views from your private lounge while you choose from a selection of fresh fruit and local treats. Or just head to the bar, the first one’s on us.